The Roman fort at Cardiff was probably established at the end of the 50s AD, on a strategic site that afforded easy access to the sea. Archaeological excavations indicate that this was the first of four forts, each a different size, that occupied the present site. Remains of the Roman wall can be seen today. ‘The Essential Cardiff Castle’ by Castle Curator Matthew Williams is the definitive guidebook to the fascinating history of this site and is available from the Castle Gift Shop. 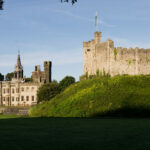 Cardiff Castle is open 7 days a week, all year (apart from 25, 26 December and 1 January). Please note that last admission to the Castle and its grounds is 5pm ( March to October) and 4pm (November to February).